Thanks...that was the last part I was wondering about -- which size set screws to use, and whether to use the conical type. The hex hole for the Allen Wrench in #10 set screws was too small,and I was afraid to strip it when I crank it, so I found these with slot at local hardware store, they have slots just like the Festool ones. Just finished one connector. Still have to add the little screws to hold the bottom piece to the top piece and finish the second connector. But I must say the connector locks up in the rail quite nicely. Looks like it is going to work perfectly. I hope to cut some ply this weekend so I'll be putting two 55" rails together so we'll see how they really work. I really like this design over the standard connectors. Hope Festool will finally take notice. If you are looking for a place to store these while not connecting two rails together, here's a suggestion. I use the 1900 rail a lot on my homemade tables and find that it has more flex than I would like, especially when resting the saw on a portion hanging over the end of the table. I have taken to using the standard connectors in the underside slot as stiffeners and have been pleased with the results. I believe your longer bars will be even more effective. I usually put one near the close end of the rail and the other nearer the center. I also never have to remember where I put them. The difference between theory and practice in practice is greater than the difference between theory and practice in theory. Here are mine. Roughly 15" long. @Slartibartfass- that's a nice looking drill press/milling vice. What model is it? Would these homemade connectors also work as MFT connectors? Speaking of MFT connectors, are there any threads concerning them(yours or others)? I just ordered a second MFT/3 and was already thinking about doing something with 8020 when I saw yours. The MFT connectors are 14mm x 9mm. You would need some different stocks for that purpose. I would try layer of 12mm x 9mm stock plus a layer of 2mm x 9mm stock. There are something called "Key Stock" available that are 14mm x 9mm. You have to do some machining of course. Do you think these would work acceptably if made from T6061 aluminum instead of steel? I know the Festool ones are steel but I'd really like to stay away from using a dissimilar metal if aluminum would work? Also it would be easier to work with than steel. I know it wouldn't be AS strong, but the question is "would it be strong ENOUGH"? When I made my rail connectors I used 12 x 3 mm stainless steel so I don't have to worry about rusting. I also made them 500mm long and they line up the rails perfectly. When I mentioned MFT connectors, I was actually referring to Slartibartfass's. I was wondering if you could use longer lengths of 8020 and have gaps between the tables. Maybe even another work surface between them? To use these style of connectors (not my idea btw) you would just need to up-size them. As to using 80-20 you can hang them on the MFT/3 profile between tables to act as a support.... works with the 8020 T Slot Aluminum Extrusion 15 S 1515 ULS profiles. i've done that to hang some Festool clamps or small extension tables to the MFT/3 (also not my idea....power of the FOG at work....). Thanks to all who contributed to this thread. Great idea - the 2 pieces - 2 and 4mm. I made 2 sets (3 rails) last week and while they are not as perfect looking as some, they work well. I made them 18" long and used 1/4" 24TPI set screws. Used McMaster steel because I could not find a metric supplier here in Canada - land of metric!! Here's hoping that the good folks at FT get the message - the standard ones don't do the job! I was getting at least 1/8" play in the track. That makes for some very poor cuts, especially when using the TS for hardwood glue ups. I made two sets of these with a few changes: 1) a punch mark in the middle to make sure they are centered between the two tracks 2) I used a 1/16" roll pin at each end to keep them together and 3) filed the ends with a very slight taper and rounded the ends a bit to make them easier to insert into the slot in the track. They work great. I broke down a dozen sheets of 3/4" ply without any movement and everything was within ~0.5mm. My only regret was not making them a bit smaller so they fit into the TS55 systainer. The ones I made barely fit diagonally in a systainer. The ones I made barely fit diagonally in a systainer. Mine were also too long so I just leave them in the middle of the longer track. That way you always have them on hand and the screws don't get lost. The hockey puck shimming up the MFT is particularly genius. It's not a hockey puck but individual round rubber slices you use to level a billiard table. Bought 'me on Amazon.com if I remember correctly in various thickness. I'm reviving a dead horse here, after being reminded of this on @UncleJoe 's thread. I purchased the materials to make these, but I don't have a drill press. I've drilled through metal plenty of times with my hand drills, but it seems like precision may be more critical here. Is it possible to do these without a drill press? Or should I be looking to find time in a shop that has one I can use? Is it possible to do these without a drill press? I did it without a drill press. Great idea! I'm glad this thread has resurfaced. I am going to order the materials to make a set for my DeWalt tracks. Neat. I'm going to have to put a pair of these together. 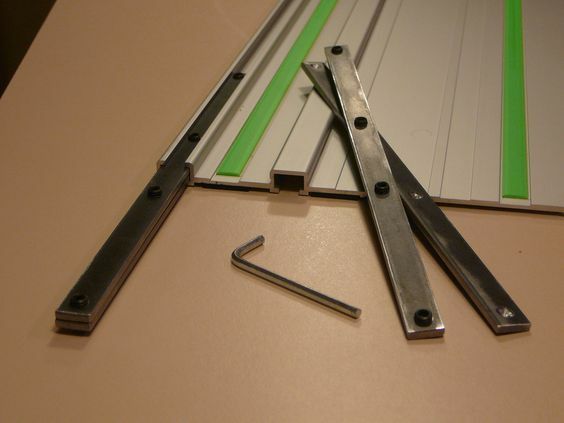 I don't feel like the Festool connectors are very stable when it comes to a lot of lifting and replacing the guide rail. Thanks to everyones ideas & input and @Bohdan for the info. I bought 4m bar from merchant as that was there minimum supply plus $4 a cut! I bought a Tap & Die set last week from Aldi for $29.00 as I knew I needed one for this project. It worked a treat as I'd never done this stuff before. I didnt bother with the 2 screws to hold it together as the bars are clamped nice and tight. One note that they do sell Mild steel but was 13mm x 3mm - it might fit and would be easier to cut and a lot cheaper. The end of the rails are not necessarily square; and there will be slop in the channel for 12mm connector, so you would need a straight edge to align the rails. I use Betterley straightline. Here is a repost of the original picture as it is gone.